There are hotels wherever you look in Varadero. 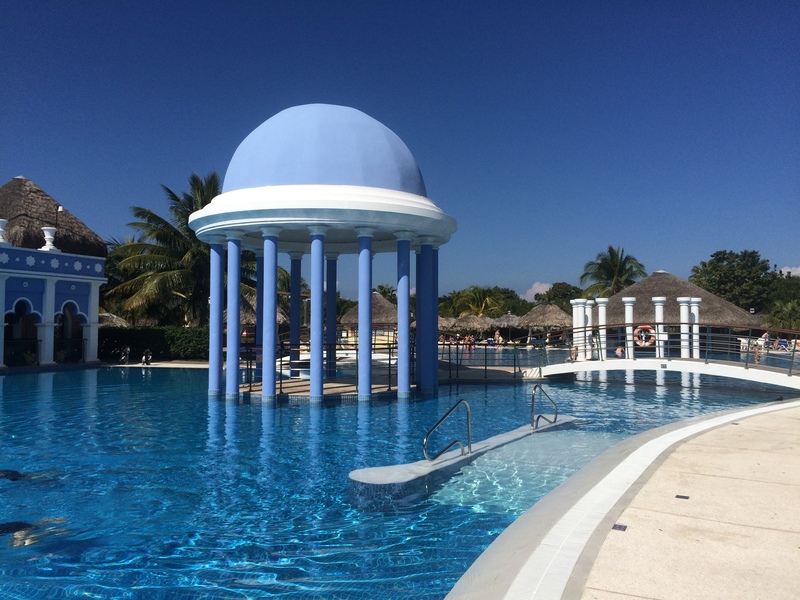 Popular with tourists from around the world, the all-inclusive buffets and fine beaches at these (mostly) luxury establishments are all that many will see of Cuba during their break in the sun, especially if they land at the local airport. The resort – built along a 25km peninsula of white sand about a two and a half hour drive east from Havana – was first properly developed in the 1950s, but then came the Cuban Revolution and as tourism was not overly promoted for many years, hotels suffered from a lack of investment. When the economy was struggling in the 1990s, this was the industry the country turned to. After 10 days of sightseeing in Havana and travelling around western Cuba, it was time for a couple of days break. 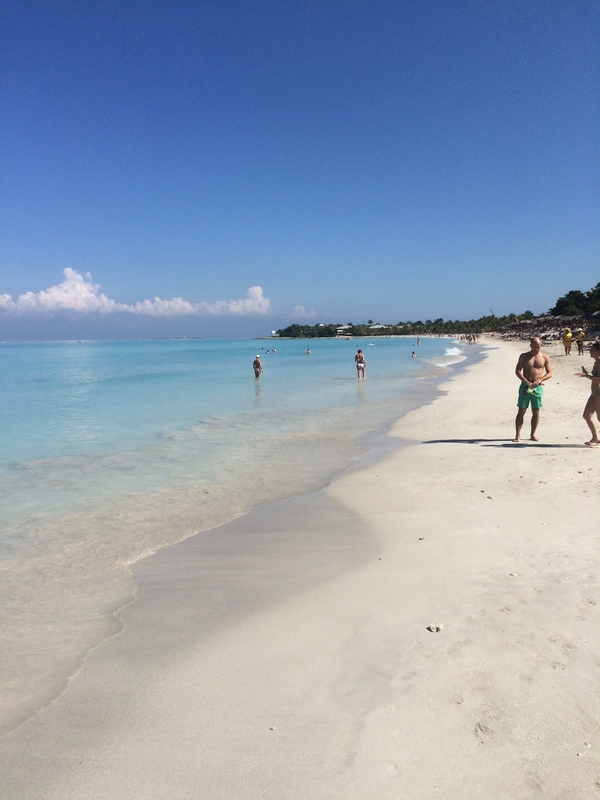 At Varadero I would experience what has now become Cuba’s most important industry. The further you get along the peninsula, the more pleasant (and newer) the hotels became – set in more spacious grounds. While mine was not the most expensive in the area by any means, it was closer to what you might find in Florida Keys than a nasty Soviet-style holiday camp monstrosity down the road (I felt sorry for anyone who had booked into one of those blocks). Tourism didn’t quickly disappear during the years it was allied with the Soviet Union. In a fascinating account of Cuba from 1977, photojournalist Fred Ward noted that around 60,000 tourist a year were visiting the island, mainly from socialist countries and places like Canada. Most followed two routes, either flying straight into the airport at Varadero – “…a winter dream with over a dozen miles of pure white sand, and incredibly clear, blue water” – or visiting the sites in Havana. Taking in a few different places on a single trip just wasn’t possible on a single trip, as movements of visitors were carefully controlled. Ward said the popular historic hotels like the Nacional should be avoided given their state of repair. But he said there were plenty of eating possibilities outside the hotels, serving an array of dishes, including steak (“tender and tasty” in La Torre which enjoyed a splendid view of Havana), lobster and shrimp. And there was also plenty of entertainment on offer, with both tourists and workers enjoying cut price seats at the likes of the flamboyant Tropicana cabaret show. While begging was prohibited, Ward said Cubans hung around by hotels pestering for goods that they could not buy on the island. Girls were out on the streets in the evenings “looking for dates, are willing to trade their favours for goods rather than money.” In addition, young boys “who only get one pen a year” can be found asking foreigners for “pens, cigarettes, and souvenirs.” On the beaches tourists needed to be careful of petty thieves on the lookout for beach items as simple as towels. Following the fall of the Soviet Union in the 1990s, Cuba faced an economic crisis as it lost out on vital revenue from its main backer. And it was decided that tourism would fill the void, triggering a wave of building work in resorts like Varadero and the creation of a number of new government-run hotel chains. As I found earlier on during my stay in the Plaza Hotel – part of the state’s Gran Caribe outfit – in Havana the standards for tourists aren’t always that high in these. They are often grand, century old properties but are best seen as faded splendours, creaking at the seams and in need of renovation. The food served in them leaves a lot to be desired. Travelling around Cuba it also made me laugh seeing a number of different travel agencies have desks in the big hotels. But there’s no real competition here – they are all brands owned by the government and offering the same trips. 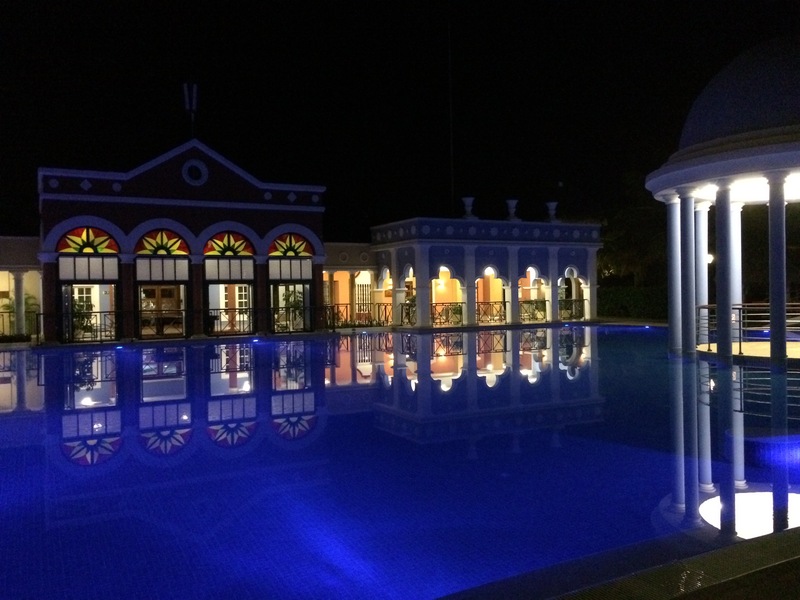 What has really raised the bar for quality accommodation in Cuba has been joint ventures with Canadian and European hotel groups such as Mercure, Iberostar and Melia. The government always retains a controlling stake in properties, but the management is undertaken by organisations that really know about the hospitality industry. For the Cuban economy things have truly come full circle. Sugar had for many years been the most important industry on the island. When relations collapsed with the US and it lost its main purchaser of the production terms were agreed with the Soviet Union to buy sugar at inflated prices. Production grew by 40% from 1960 to 1990, by which stage the industry was the largest employer and occupied 45% of arable land on the island. The challenge came however when the Soviet Union was dissolved and Cuba lost a valuable customer. And in 2002 the Cuban government said 71 out of its 156 sugar plantations would close, with a quarter of the industry’s workforce made redundant. The sugar industry is by no means dead however. Following the decision to abolish the Sugar Ministry in 2011 – and the subsequent creation of the Sugar Industry Group, those at an operational level are facing much more autonomy. But as Cuba looks to the future, it’s tourism (which replaced sugar as the number one industry in 1995) that will keep the economy afloat. The number of joint ventures – and hotels in general – has grown considerably in recent years in Cuba. Thankfully things have moved on from the 1990s when Miami-based exile organisations declared war on the tourist industry. Terrorists fired machine guns from speedboats at beaches. And in a string of nightclubs and hotels were hit, resulting in considerable casualties. Fidel Castro almost seemed to be apologising to Cubans when he talked to the nation about the need to promote tourism two decades ago. But since then, he and his brother Raul have been advocating the model of capitalism abroad and socialism at home, a compromise that will perhaps keep the values of the Revolution alive. Tourism gives more Cubans the opportunity to tap into the foreign currency of the former – through tips for example – while still benefitting from all the benefits that the state provides. But there are some sticking points in this model, not least in how salaries are paid. Foreign companies (there are currently 208 foreign investment projects in total) are forced to use hiring halls, which reduce management’s ability to hire and fire workers. Under Cuba’s dual currency system, staff are paid in pesos a fraction of the sums that businesses must cough up in convertible pesos to the state for their services. Often foreign companies apparently pay staff additional sums of money under the table to their staff to motivate them. In Raul Castro’s changing Cuba there is however every possibility that the rules around salaries will evolve in order to attract more foreign investment. After all, the government sees this revenue, and stimulating tourism in general, as vital. During my stay in Varadero I wanted to see if I could find anything that resembled authentic Cuba. I jumped on the open top bus that runs around the peninsula but most of the 45 stops were nothing more than the forecourts of hotels. In reality it seems most people here don’t leave the grounds of their hotels, so bar a dolphin park and ecology centre at the eastern end of the peninsula (where better hotels can be found), there is little in the way of big attractions here. If you are looking for the real Cuba in all its greatness, look elsewhere. But if you want somewhere to chill out – for a few days with calm waters for a spot of ocean swimming and free flowing mojitos right on your doorstep – then this is your place. I certainly had a good break and enjoyed some good food and drink here as well.